Metal-metal interactions are very common in polynuclear metal complexes involving two or more metal ions and play an important role in determining their electronic and magnetic properties as well as their overall reactivity. We are studying metal-metal bonding in dinuclear and trinuclear transition metal complexes with the overall aim to identify and quantify the underlying electronic factors that affect the extent and type of metal-metal interaction such as the identity of the metal ion, it’s oxidation state and coordination environment. Density functional methods combined with the broken-symmetry approach to analyzing the magnetic interactions between metal centers, has proven to be a reliable and efficient procedure for calculating the geometries and magnetic properties of such complexes spanning the whole range of metal-metal interactions from weak magnetic coupling through to multiple metal-metal bonding. Using this approach, we have determined the periodic trends in metal-metal bonding for a whole series of dndn (n = 1 – 5) dinuclear complexes as well as dndn+1 (n = 1 – 4) mixed-valence systems. 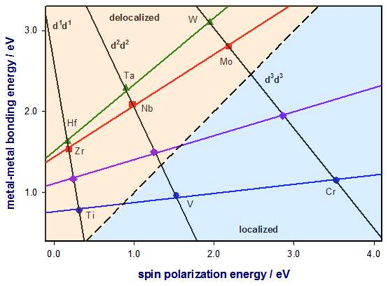 These calculations have established the strong dependence of the metal-metal bonding on key electronic factors such as the unpaired spin-density on the metal centers.